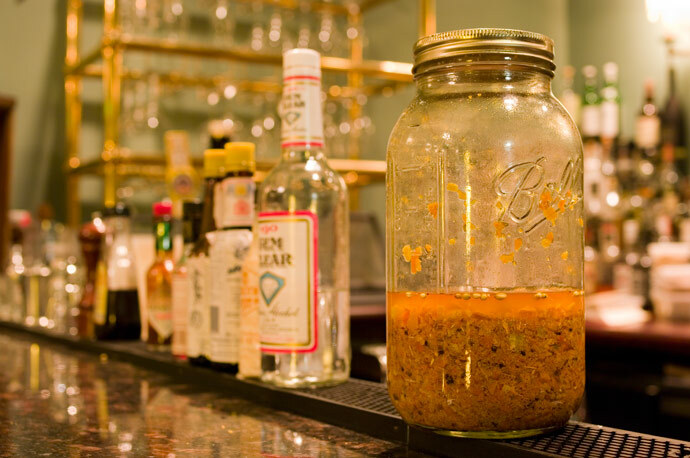 So you probably already know Post Prohibition is all about handcrafted libations. We are currently in the process of making custom bitters, taking the craft of the cocktail to the next level. We started with a basic orange bitters recipe from The Joy of Mixology by Gary Regan. You might ask, “What are bitters?” Bitters are cocktail seasoning, like salt for a soup. Back in the 1800’s, bitters where used for medicinal purposes. They were a potion of healthy herbs and botanicals. To some degree this is true. Try drinking ginger ale and Angostura Bitters when you have an upset stomach. It helps. Although, I’m sure back then it was a great excuse for pops to get a little tipsy while he took his “so called” medicine. The first two cocktails, the Sazerac and the Old fashioned, were made with bitters. In fact the word cocktail used to mean a drink with any spirit, bitters, sugar and water. Bitters are bitter. However, when you add just a few drops to a cocktail they’re not going to make your cocktail bitter, so don’t be afraid. Bitters can really pull certain flavor profiles out of your cocktail recipe and bring a whole new complexity. Try a Manhattan without bitters, then add the bitters and you will see a world of difference. Allow four weeks to prepare this bitters recipe. Place the peel, cardamom seeds, caraway seeds, coriander seeds, quassia, cinchona bark, gentian, grain alcohol, and 1/2 cup water into a half-gallon mason jar and push the ingredients down so that they are covered by the alcohol and water. Seal the jar. We dehydrated our own orange peels, it took about 30 oranges, but the freshness is outstanding. Make sure you remove all the white pith. Shake the jar vigorously once a day for fourteen days. Strain the alcohol from the dry ingredients through a cheesecloth. 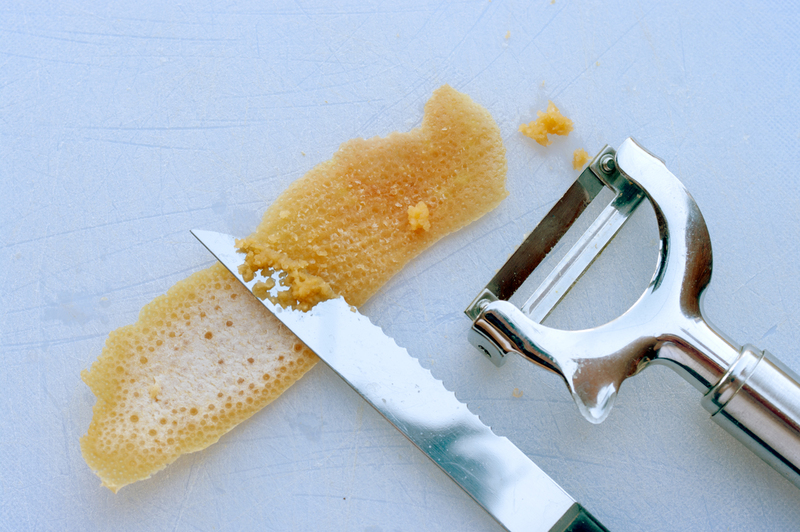 Gather the ends of the cheesecloth to form a pouch and squeeze tightly to extract as much alcohol as possible. 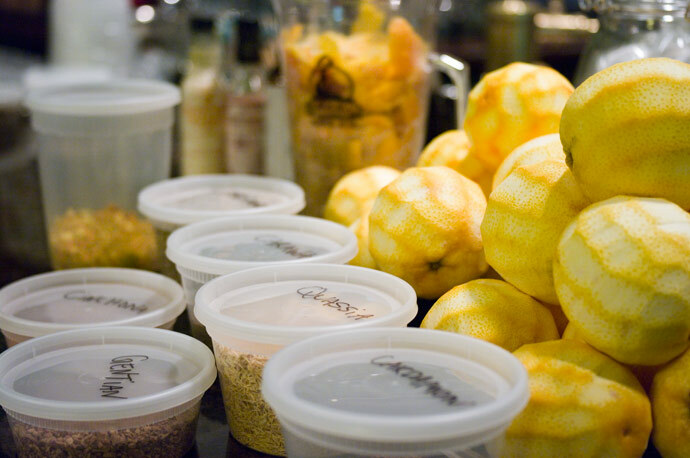 Place the dry ingredients in a strong bowl or mortar; reserve the alcohol in a clean mason jar and seal tightly. Muddle the dry ingredients with a pestle or strong spoon until the seeds are broken. 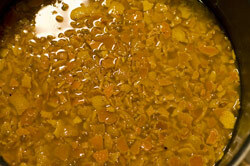 Place the dry ingredients in a nonreactive saucepan and cover with 3 1/2 cups of water. Bring to a boil over a medium-high heat, cover, turn the heat down, and simmer for 10 minutes. Allow to cool, still covered (about 1 hour). Return the dry ingredients and water to the original mason jar that contained the alcohol, seal, and leave for seven days, shaking vigorously once a day. Strain the water from the dry ingredients through a cheesecloth. Discard the dry ingredients and add the water to the alcohol. Put sugar in a small nonstick saucepan and place over a medium-high heat. Stir constantly until the sugar becomes liquid and turns dark brown. Remove from heat and allow to cool for two minutes. Pour the sugar into the alcohol-and-water mixture. At this point the sugar may solidify, but it will quickly dissolve. Allow the mixture to stand for seven days. Skim off any bits that float to the surface and carefully decant the clear liquid to separate it from any sediment resting on the bottom. Measure the bitters; there should be about 12 fluid ounces. Add 6 ounces of water, and shake thoroughly. Pour the bitters into a bitters bottle. Store for up to twelve months. Hello! i was wondering, what do you mean by gentian? gentian the flower? the extract? the seed? The Root . It comes in dried chipped form. I get most of my herbs for bitters, tonics, mixers, etc. from Penn Herb. They have just about all the ones I need, especially some of the harder to obtain ones (like cinchona). For this recipe, I upped the alcohol to 4 cups then upped the water to 4 cups for the simmering. It should be ready by Easter so I’ll know how the alterations affected it. I followed this recipe very closely and ended up with some beautiful translucent orange bitters. However, when it came time to dilute I did a trial and found that as soon as water touched the bitters they turned opaque (like orange juice.) The water had done the same as soon as touching the solids to make the dilution liquid. I’ve made a handful of other non-citrus based bitters and haven’t run into this. Any thoughts? Thanks! When I make Limoncello, if I add water afterwards, it will louche — turn cloudy like Absinth does when you add water. I don’t know what does this, but it does not adversely affect my limoncello. However, I have a different question. I too am following the recipe above and have encountered a different situation. I removed the solids, mashed and boiled as directed and let them sit a week. When I went to strain the liquid (it had been absorbed into the orange peel so I had to wring the cheesecloth to extract any liquid), I didn’t get a liquid but slime. I tasted the “slime” and it tasted bitter orangey (as I would have expected). Has anyone else gotten slime? I read elsewhere (on making Boker’s Bitters) that heating would cause the “slime” to “melt”. Any suggestions? Another site suggested melting it, but that only lasted as long as it remained warm. Another suggested adding pectic enzyme (used in extracting fruit juice for beer and wine) which should cause the pectin to fall out of solution. As the bitters were cooling, I noticed “clouds” in the liquid. These were “clouds” of pectin and when melted made my jelly. Kurt — this could be what discolored your bitters as well. I’ll post here if the pectic enzyme works. Is the clear decanted liquid the bitters? The clear decanted liquid is the bitters. The pectic enzyme did the trick. It took a little while and quite a bit of the enzyme to “kill” the pectin, but I was able to extract the bitters and leave the pectin behind. The resulting bitters are WONDERFUL. 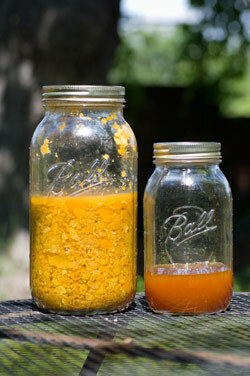 I did loose some of the volume because of the pectin fiasco, but will be making another batch soon. I gave a lot away to bartenders and other cocktailing friends who were impressed. BTW — the recipe comes from a book called The Gentleman’s Companion. If you haven’t read it, you should. The stories that accompany each recipe are worth the price of the book. Bitter Truth orange bitters are fabulous dashed into a margarita. I love the way the spices blend with tequila. They’re also good in citrusy rum cocktails, such as a daiquiri. Can it be made with Vodka and cut down the water? In this recipe, how much alcohol you end up? You want to be sure you’re using something “hi test” for the extraction. A high proof alcohol will do better extracting than a lower proof. Everclear work very well for this. I have taken to using Devil Springs Vodka — it’s a high strength vodka distilled in New Jersey. I think it clocks in at about 160 proof. Be careful, this stuff will be flammable until you water it down some. (When I was melting my orange bitters jelly, it turned into orange bitters flambe LOL). Super old post, but in case anyone else runs into same issue: after I squeezed water/dry ingredient mixture and combined it with the alcohol mixture, I got about ~28 oz. of liquid, not what the recipe says will be “about 12 oz.” What did I do wrong?? Is there too much water in the bitters, now? Also, I’m showing how few times I’ve melted sugar, here (0), but I think I melted mine to hard crack (in my defense these directions aren’t that descriptive…), and trying to dissolve it into that last mixture was like trying to dissolve hard candy. I probably only was able to dissolve half of it before I gave up. I’m not too concerned about the volume of sugar, since no other orange bitters recipe I’ve found even calls for sugar, but will the degree of cooking mess with the final product’s flavor, I wonder?